I met Derryl Willis at a Chen Xiaoxing workshop in Chicago several years ago. He is a disciple of Grandmaster Chen Xiaowang and the instructor at the Seattle School of Chen Style Taijiquan. He has made many trips to China to study in the Chen Village. And on his first visit, he stopped traffic just by walking down the street. In this Internal Fighting Arts podcast interview, I talk with Derryl about the meaning of being a disciple, the importance of practicing the basics, and a valuable technique that one of his teachers, Madame Gao Fu, used to drive home the body mechanics of Taiji. David Roth-Lindberg has a good Tai Chi blog called "Thoughts on Tai Chi." He recently asked me to do a Q&A and I was happy to do it. The interview was published today. Follow this link to the blog post. Matthew Polly and I have a lot in common. Bruce Lee inspired us when we were young and sparked our interest in studying martial arts. We have remained Bruce Lee fanboys even as we have grown up. We both went into journalism. I discovered Matthew's work when I bought "American Shaolin" a few years ago, a book he wrote after spending two years living, training and performing with Shaolin monks in China. It was a real-world look inside this mysterious world, and I loved it. A couple of months ago, I was in Barnes & Noble and decided to look at the martial arts section. Once upon a time, it took an entire bookcase to hold the martial arts books. Now, the books about traditional arts don't even stretch across one shelf. It's depressing. But I saw a new, big biography of Bruce Lee on the shelf, titled "Bruce Lee: A Life." When I saw Matthew Polly had written it, I bought it. It is such an exhaustively researched, wonderfully written book that I had to ask him to be on the podcast. I was very happy that he agreed. At the same time, I saw that he had spent two years training in the MMA and wrote a book called "Tapped Out." I ordered the book and began reading. Another thing we have in common is that neither of us take ourselves too seriously. The books he wrote about his experiences are full of self-deprecating humor. He's a funny guy. In this interview, we talk about "Bruce Lee: A Life," his experience in the MMA, his experience with the Shaolin monks, and the lessons we can learn from each of these fascinating subjects. Every martial artist should read Matthew Polly's books. Here is a link to the podcast. It is also available on iTunes, Spotify and other podcast distributors. 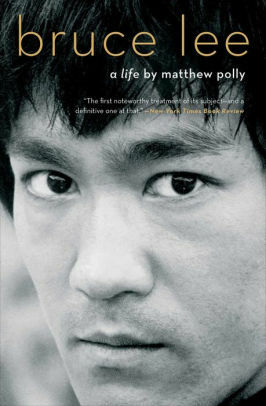 I am reading "Bruce Lee: A Life," by Matthew Polly. Bruce possessed one quality that he had in common with almost all successful people. Bruce Lee believed in himself, had a goal, and worked hard to reach his goal. Do you have a martial arts goal? Do you want to learn Bagua, or Taiji, or Xingyi? It is a good idea not to write down a goal that is overwhelming. Do you want to learn Chen Taiji? Then start with the silk-reeling exercises. Set a goal of learning one every two days, and set a time to study. It may only be ten or twenty minutes, but that is okay. Perhaps your goal is to learn a form. You can have a big goal such as "Learn Xingyi," but then have smaller goals that help you achieve the big goal. Do you want to learn the Five Fist Postures? Then write down your goal, set a day to complete it, and then plan out the time to study and practice and get feedback. Maybe your next goal is the Bagua Swimming Body form. Set a time to complete it, then make a plan to take it movement by movement. Study part of one section each day. Before you know it, you will reach the end. Do you want to manage the stress in your life? Then set a goal to do that, and begin studying and practicing qigong every day. Even just five minutes a day can make a difference in your life if you work at it. On my website -- www.internalfightingarts.com -- members find step-by-step instruction in the skills they need, from basic to advanced, in these arts. Plus, they have the opportunity to get personal feedback on their movement, mechanics, techniques and their progress. But they have to set their own goals and work at them. Success in anything does not happen just by thinking about it or watching free YouTube videos. What are you going to do about it today? How much time will you spend setting your goal and planning the steps and the time you will take to get there? An instructor can only point the way. The rest is up to you. Bruce Lee didn't let anything stop him from achieving his goal. At one point, he was earning less than $200 a month teaching gongfu. His first school closed because students moved away or had to quit for various reasons. He faced discrimination in Hollywood and the cancellation of his first TV show, "The Green Hornet," left him unemployed. But he had the vision. He knew what he wanted and he did not let anything stop him. Unfortunately, he did not live to see just how well he achieved his goal, but he did achieve it. So can you. I came across Graham Barlow's blog, the Tai Chi Notebook, a few months ago and saw that he would be a good guest for my podcast. Graham has studied Tai Chi for 25 years and began studying Brazilian Jiu Jitsu at age 39. He now has his black belt in BJJ. So do the skills for self-defense in Tai Chi transfer to jiu jitsu, or does BJJ simply give you more tools for your arsenal? Here are links to the podcast. Listen online or download it for listening on the go. It is also available to subscribe in iTunes (Apple Podcasts). Ken at St. Ambrose University in January, 2016. The university cost $28,000 a year -- just for tuition. There were a handful of students who tried. I wondered why the rest of them were there. Why were they spending the money and not trying? You can now listen to the Internal Fighting Arts podcast on Google Play Music. The podcast is also available on iTunes (Apple Podcasts), Audello, Stitcher, Podbean, and other podcast distributors. I hope you will subscribe. The interviews take a real-world approach. It is a Woo-Woo Free Zone. In 1990, I won a Gold Medal at the AAU Kung-Fu National Championships performing the Yang Tai Chi 24 Form, the short form that is practiced daily by millions of people worldwide. It is the most popular Tai Chi form in the world. It took me 28 years, but I finally recorded step-by-step instruction and put it on a DVD. It is 2-1/2 hours of step-by-step instruction with a fresh perspective on body mechanics and movement. The DVD includes complete demonstrations of the form from front and rear views, at regular speed and in extra slow motion. Then, I guide a student through each movement. That student happens to be my wife, Nancy. I teach her the form as we go, and you will learn by watching the mistakes she makes and you will learn what to avoid as I humiliate, I mean COACH her through the movements. Nancy is a good sport, and there is an outtake reel at the end of the DVD. Even if you have studied the Yang 24 form, I believe this DVD will give you new insights into the body mechanics of the movements. I show you details of the movements that are rarely taught by instructors who teach this form. The video is already online on my website, Internal Fighting Arts. Many of my members began their Tai Chi journey with the Yang 24, as I did. The reactions to the instruction have been better than I expected. When I began teaching in 1997, the Yang 24 was part of my curriculum. I taught it for a few years, even after I switched from Yang style to Chen style in 1998. After studying the body mechanics of Chen Tai Chi, I realized what was missing in a lot of the Yang Tai Chi that you see being performed around the world. Many people are doing an empty form. This DVD attempts to correct that. You will learn how the ground path, peng jin, whole-body movement, Dantien rotation and the kua are used in the movements. You will learn how to sink your energy and use spiraling movement. The Yang 24 was designed by a committee of experts in Beijing in 1956. It was intended to be a simplified form that people of all ages could use for fitness, exercise, and "moving meditation." Tai Chi is a martial art first and foremost, but the Yang 24 is not usually practiced that way. This DVD is intended to teach the form for health and fitness. Clinical studies have shown that older people who practice Tai Chi see benefits ranging from improved balance and leg strength (fewer falls among the elderly) and reduced blood pressure and stress. You will learn the Yang 24 Tai Chi form from this DVD. This is a Tai Chi beginner form that got me started in the art. It fits into anyone's hectic, modern lifestyle, and it can bring you benefits in health and quality of life. The DVD costs only $19.99 and it comes with an Iron-Clad, No-Hassle Money-Back Guarantee. There is Free Shipping Worldwide. If you aren't satisfied for any reason, mail it back and receive a prompt refund, including your mailing costs. Click the button below for our secure order page. 45 years ago tonight, on September 20, 1973, I entered my first martial arts class in my hometown of Lexington, Kentucky. It was the start of the Bruce Lee craze. "Enter the Dragon" had only been in theaters for a little more than a month and Bruce had only been dead for two months. "Kung-Fu" was a popular TV show. I loved David Carradine's show and I had seen "Enter the Dragon" half a dozen times. The crowd of new students that night spilled into the parking lot. I was 20 years old, a student at Eastern Kentucky University. I had no idea that I would still be in the arts 45 years later, and that I would be working at it full-time after more than four decades. I stayed in my first school long enough to earn a brown belt, then I began exploring, studying Taekwondo, Tien Shan Pai kung-fu, and discovered the internal arts in 1987. In 1991, I was working as news director of the TV station on the Iowa State University campus in Ames, Iowa, and was practicing in the gym when the coach of the ISU Boxing team, Coach Terry Dowd saw me and invited me to workout with the team. I was 39 and they sort-of adopted me. I trained with the boys for two years. Since 1973, martial arts and Eastern philosophy have been an important part of my life. It has become part of who I am. I'm pondering some of the lessons I've learned over the past 45 years. The martial arts attracts people with controlling personalities sometimes, and sometimes the arts attract people who want others to see themselves as mysterious, possessing supernatural powers. There are really great, caring people and also those who will lie about their backgrounds as they take your money. It attracts some people who think critically and others who will believe almost everything their teacher says. There are people who maintain their humility and there are others who troll the internet and Facebook and slam everyone they see. But beneath all the noise are these self-defense arts. After 45 years I still think they are cool, fascinating, and I take them seriously but I still have as much fun practicing now as I did when I was 20, even though after all these years, losing a lung and developing a heart issue has made it a little more challenging. 45 years went by quickly. I hope to keep training, learning and improving for years to come. Thanks for being part of my journey by reading this.